The tree component can be used to display hierarchical data. The tree component renders its view using a javax.swing.tree.DefaultTreeModel Object as a model. Client side Swing developers who are familiar with the DefaultTreeModel and the DefaultMutableTreeNode class will find an easy migration path to the ice:tree component. The following screen shot is of the ice:tree component using the CSS XP theme. The tree displays its data vertically where every node of the tree is represented by a DefaultMutableTreeNode. A node can either be a leaf or branch depending if it has zero or more child nodes. A user can click on the branch expand/contract icon to toggle the visibility of child nodes. The root tree node visibility can be togged by setting the the tree hideRootNode attribute to false. Each DefaultMutableTreeNode wraps an IceUserObject which contains instance variables for common tree node node properties such as icon paths, tool tips, display text and expanded state. Creating a basic tree component is a pretty standard process comprising of two parts. The first part consists of building a backing bean which will contain the DefaultTreeModel. The second part is to add thetree component to your ICEfaces application. Here is a picture of a rendered tree which will be created. The following code, is taken from TreeBean.java which builds a simple DefaultTreeModel, one root node with three child nodes. The TreeBean must expose the DefaultTreeModel instance variable as it must be linked to the tree components' value attributes. Download the tree-basic source code here. Expand one or more nodes by clicking on the small square with a plus sign. Collapse a node by by clicking on the small square with a minus sign. Notice how the tree component has a treeNode child component. This child component is sub-child further with a facets named content. The facet name is self descriptive and allows for any type of JSF component to be added to them. 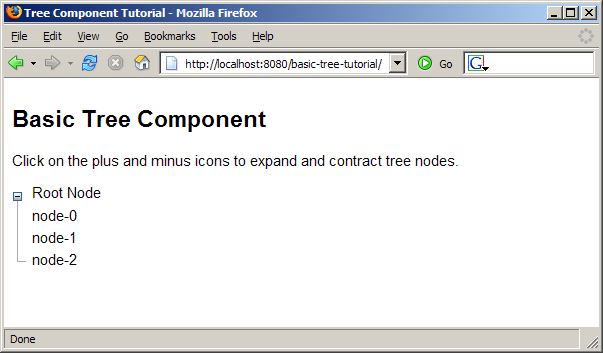 There is also an icon facet which should be used to hold components related to a tree node icon. The content facet should be used to hold components related to a tree nodes text label. The tree tag is iterative and will apply its child component hierarchy to all of the DefaultMutableTreeNode found in the DefaultTreeModel. To summaries the tree component can be created with a simple binding to a backing bean which contains a DefaultTreeModel. You do not have to write any code to make the tree nodes expand and contract. Now that every node can have a unique URL we need to update the JSF code in the linkTree.jspx file. The following code shows how to add a commandLink to an treeNode which takes advantage of our new UrlNodeUserObject object. Download the tree-link source code here. 1.Click on a tree node nodes' text, a new browser window will open with the corresponding URL set in the in the UrlNodeUserObject object. Customising the IceUserObject is quite simple and when it is combined with the iterative nature of the tree component, it can be quite a powerful tool. The next section will show how to respond to node selection. The PanelSelectUserObject needs to be able to respond to a user click and update the the internal state of the backing beans. The user clicks are handled by binding a method to the tree nodes action listener. Here is the code needed to respond to a users click. The PanelStackBean object is introduced in this code block which is responsible for maintaining the state of selected panel stack in the panelStack component. The full source for this simple class is available with the tree-selection demo source code. Download the tree-selection source code here. 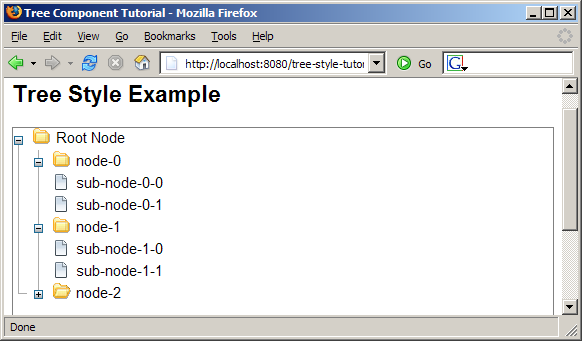 Click on a tree node, the panel stack will show the corresponding panel content. Setting up a tree component for user interaction is a relatively simple process which utilizes action listener mechanisms in the JSF framework. Each tree node's backing bean is responsible for setting a selected panel in the panelStack component. The component nature of JSF allows for easy encapsulation of application logic which makes application quick to build and debug. The follow is a screen shot of the tree-selection demo. In preceding section we have seen how the tree component iterates over a DefaultTreeModel binding and applies a template to each node in the model. The template in previous examples used commandLinks but the template could have used any of the ICEfaces components. In this section we will apply the full Xp theme to a tree with multiple children. In summary, the ICEfaces components can easily styled using CSS and in some cases by specifying image directories like the tree component is necessary. In the next example we are going to dynamically change an tree's DefaultTreeModel which will automatically reflected in the view. 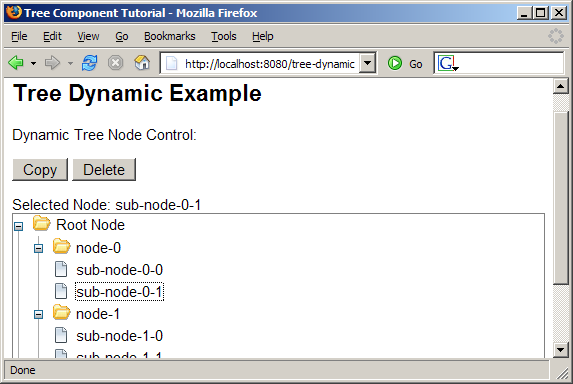 In this next example we are going to dynamically remove and add nodes from the tree. When a user selects a tree node they will optionally have a choice to copy the selected node or remove it from the tree model. The following is a screen capture of this application. The ActionListeners for the add and remove node controls can be added to the TreeBean class. When a node in the tree is clicked an instance variable in TreeBean references the source of the click. The reference to the selected node can them be used to copy or remove the selected node from the DefaultTreeModel when one of the corresponding commandButtons is pressed. Note that the root node is treated as a special case, if it is removed no more nodes can be added to the tree. Download the tree-dynamic source code here. Select a node in the tree, the copy and delete button should become enabled. Click on add or remove to manipulate the tree model dynamically. Component Showcase Available in release bundles Tree example where a tree that responds to user selection. It also has controls for removing and adding nodes. Navigation tree which manipulates a panel stack selected item. 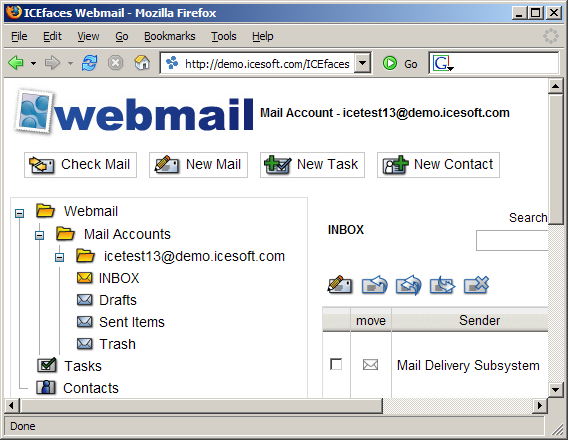 Webmail Available in release bundles Tree component used for navigation. Nodes are dynamically created depending on the number of mail accounts and subsequent child mail folders. tree-links tree-links source code Tree component which has commandLink components as nodes. When a node is clicked a new browser window is launched with the respective URL. 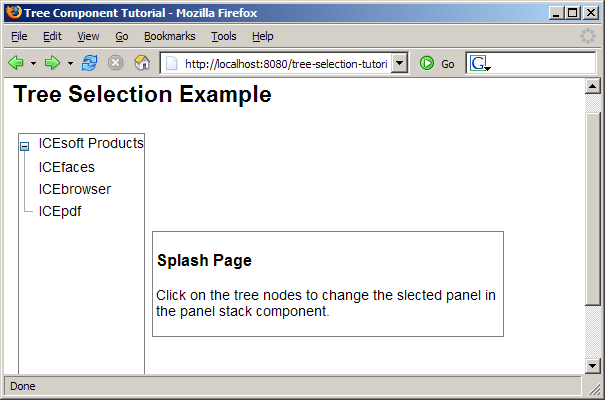 tree-selection tree-selection source code Tree component is used to manipulate the selected panel in a panel stack. tree-style tree-style source code The XP theme is fully applied to a tree component producing a fully styled tree. tree-dynamic tree-dynamic source code A tree components default tree model is manipulated by other Java Beans. This applicaiton shows how the Tree component can be dynamically changed.